I hesitated posting this since it’s a bit complicated, but the result was so delicious I had to write about it. This recipe is a great introduction to savory cheesecake and incorporates seasonal root vegetables and citrus. It’s also perfect for anytime of day. 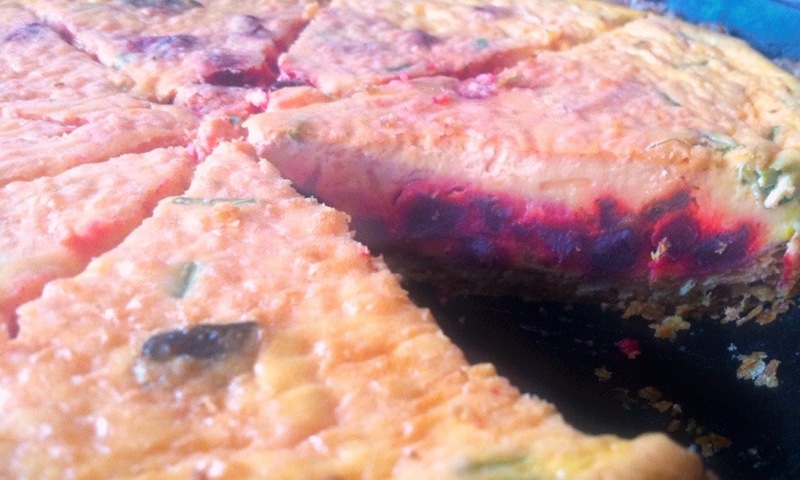 If you wish, you can simplify substantially by using a pre-made crust and prepared or frozen beets. Set the oven to 350 and skip to step 5. 2. Roll out the pie crust on a lightly floured surface, then fit to a round, oven-proof 9″ pan. Chill in the refrigerator for 10 minutes then prick the bottom a few times. Press a sheet of aluminum foil or parchment paper against the whole pastry, then fill the with pie weights. If you don’t have pie weights, dried beans or uncooked rice will work. Omit this step if you’re using a store bought crust and preheat the oven to 375 instead of 425. 3. Bake the crust for 20 minutes, then remove pie weights and liner. Lower the oven temperature to 375 and bake the crust for an another 15 minutes until golden, then remove from the oven, but keep the oven on. 4. When oven is set to 375, toss beets with a little olive oil and sprinkle with a sea salt. Spread beets on a baking sheet then roast – covered with foil – for 20 minutes, then uncover and bake for another 20 minutes. Remove from oven and let cool. Reduce oven temperature to 350. 5. While beets are cooling, beat the cream cheese and yogurt until smooth (you can use an electric mixer for this, but a plain old wooden spoon will also work well). Blend in the eggs – one at a time – then add in beets, milk, Harvarti, chives, and orange zest and juice. Season to taste with salt and pepper. 6. Pour the cheesecake mixture into the piecrust and then bake til center is almost set – about 40 – 45 minutes. Let cool completely before cutting and serving.